When my HP-42S broke down in 1998, one of my colleagues (also my former grad supervisor) gave me his broken HP-41CX and HP-19C. I described how I repaired the 41CX in another article. Here we’ll take a look at the 19C. 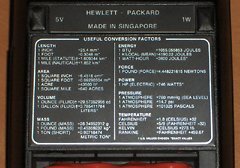 The HP-19C was one of a matched pair of high-end programmables in HP’s “20 Series” of calculators. The 19C was the printing version of the 29C, which in turn was an improvement over the similar looking 25C. With the exception of the printing functions, the 19C and 29C shared the same keys, although in a different arrangement. The programming capabilities of the 19C (and 29C) were impressive, with space for 98 fully merged keystrokes, and 30 memory registers. 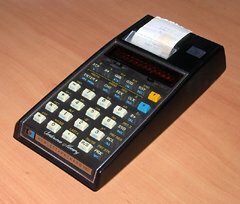 Although these calculators lacked a card reader for permanent storage, both had continuous memory that would retain the most recently entered program and 16 of the 30 registers even when the calculator was turned off (a feature taken for granted today). 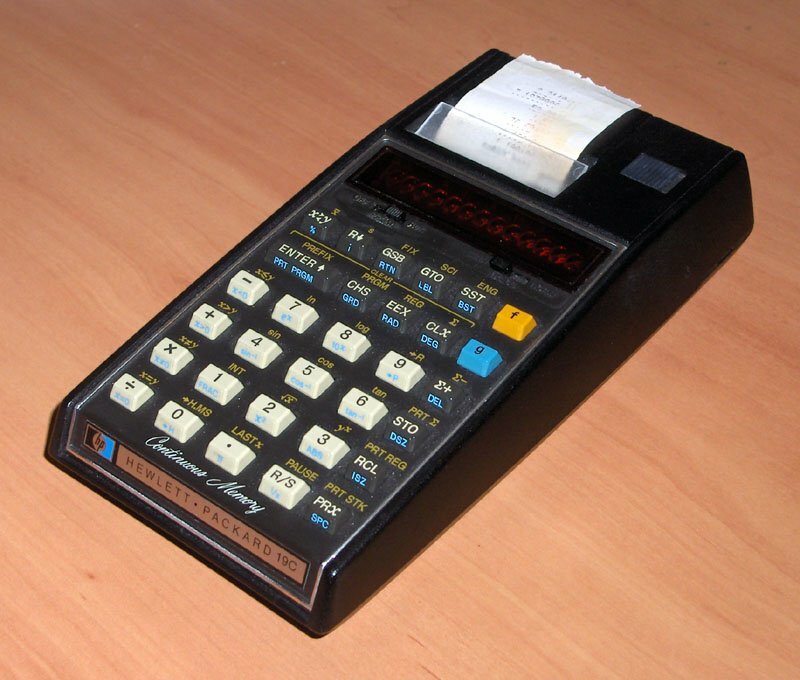 This calculator, in addition to offering a full suite of scientific and statistical functions, had very powerful programming constructs. There were eight different conditional tests (four x versus y and four x versus 0), increment and decrement instructions, three levels of subroutines, and indirect addressing of both registers and branch targets. Branching was done using labels, but indirect branching also supported relative jumps. Program editing was made easy by automatic insertion, and a DEL key. At the time that this calculator was new, I was thirteen years old and had never heard of HP calculators. Instead, I had a Commodore PR100 with 72 unmerged program steps and 10 memories, which falls far short of what the 19C can do. Of course, the Commodore cost far less as well, and I spent hundreds of enjoyable hours writing programs for it. 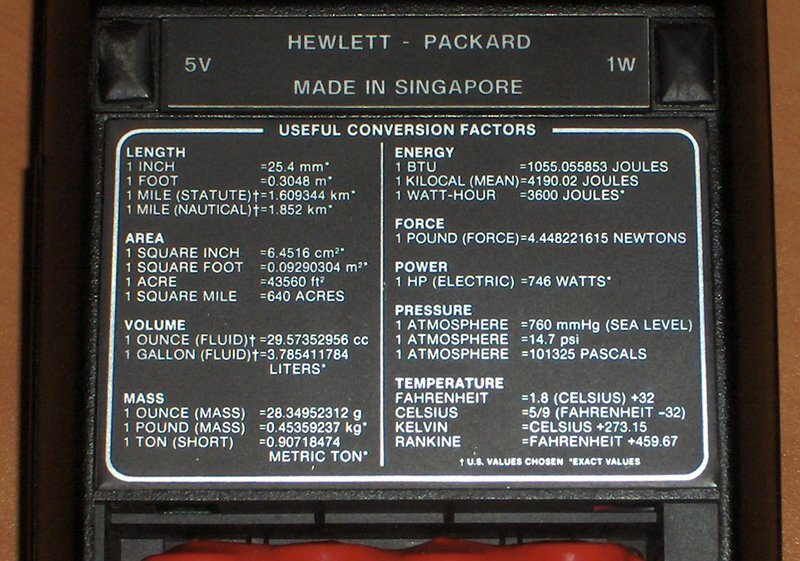 The back label contains a list of useful conversion factors. 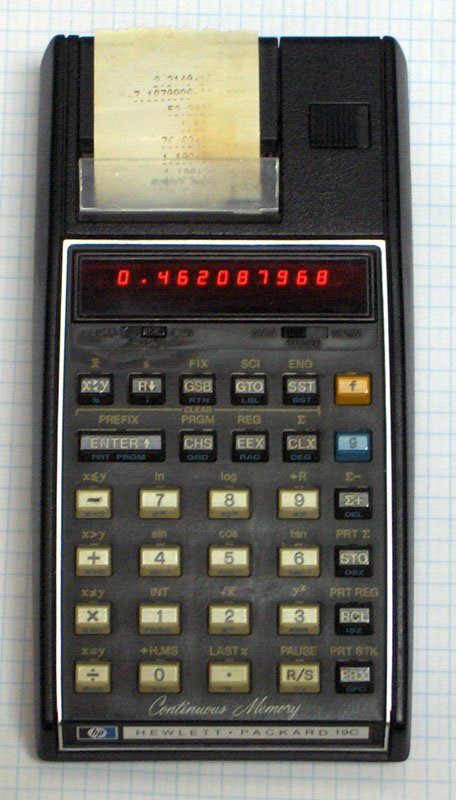 Now, thirty years later, the HP-19C is the calculator I use most often. It sits on my desk at work, and gets used several times a day for quick calculations. I’ve also written an equation solver program for it, which is reproduced at the end of this article. As I mentioned in the introduction, my HP-19C required some repairs when I first received it. It needed a new battery pack, the keyboard had become unplugged from the main CPU board, and the tabs on the battery cover were damaged (almost broken off). I fashioned a new battery pack out of 1100mAh Sanyo NiCd cells. These were state-of-the-art in 1998, and had far more capacity than the original HP battery pack (which I think was 250mAh). Rather than rely on pressure to maintain a connection with the battery contacts, I soldered the battery pack leads directly to the terminals in the calculator. My home-made 1100mAh 4.8V battery with leads soldered in place. This calculator was really designed to be disassembled. The back cover comes off after removing a few screws, and the various sub-assemblies inside just plug together. When I received the calculator, the keyboard wasn’t properly plugged into the main board (the result of an earlier repair attempt), but it was a simple matter to align the pins and put it back together. 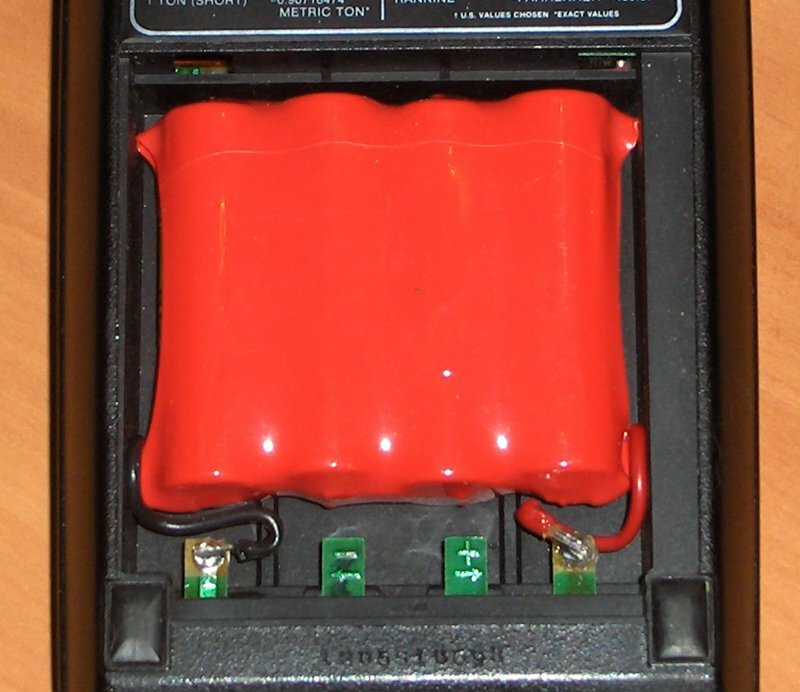 The battery compartment cover has small tabs that hold the cover in place. These were almost broken off by someone attempting to force the cover closed. I repaired these by carefully straightening them, and then running a hot soldering iron along the crease to soften the plastic. The tabs are not as strong as they once were, but they are fairly solid. A piece of foam rubber on the opposite end of the cover keeps it securely in place. The printer on my HP-19C sort of works, except for two problems: two of the print element dots are cracked, and I can’t get any paper for it anyway. I cut some appropriately narrow strips of paper from a roll of thermal fax paper to test the printer, and noticed two rows of dots missing. Upon disassembling the printer, hoping to find a loose connection, I discovered cracks in two of the print head’s heating elements. Testing with an Ohm-meter confirmed that these were open-circuit. But even without the printer, this makes a nice desktop scientific calculator, and it’s the one I keep on my desk at the office. One feature of the HP-42S that I missed was the equation solver, so I set out to write a simple one for the 19C. I submitted it to the Museum of HP Calculators, and it now appears in their software library. I’ve also reproduced it here. The HP-42S has a solver where you can provide a program for an equation of n variables, fix any n-1 of these variables, and solve for the remaining one, so I wanted mine to have the same flexibility. My solver uses the secant method, in which the two most recent guesses are used to define a line. The point where the line intercepts the x-axis is used as the next guess. When two consecutive guesses are the same, the solution has been found. I’m sure this solver is not as good as the one in the HP-42S, but it works sufficiently well for my purposes. It can get into an infinite loop on periodic functions, like sin(x). Using the solver is simple. First, rearrange your equation so all the terms are on the left hand side. In other words, rewrite it in the form f(a1,…,an) = 0. Next, enter the left hand side as a subroutine with label 9. The variables are represented by the like-numbered registers (i.e. a1 is in register 1, and so on). To solve for any one variable, store values for all the other variables in the appropriate registers, enter two initial guesses for the variable you wish to solve for, enter the variable number, and press GSB 0. See the sample problem for more details. What is the resistance of a 5kΩ and 10kΩ resistor in parallel? The answer is 3.3333kΩ. What resistance is needed in parallel with a 10kΩ resistor to give a 2kΩ parallel resistance? The answer is 2.5kΩ. If the program cannot find a solution, it will eventually end up dividing by zero, which will display Error. For example, what resistance is needed in parallel with a 10kΩ resistor to give a 12kΩ parallel resistance? It’s not possible to put something in parallel with a 10kΩ resistor and end up with a higher resistance. 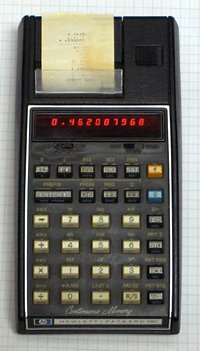 I have been using my HP-19C since I obtained it new and in the box while I was a chief engineer at Hughes. I particularly liked, and still do, the "reverse polish" notation system rather than the more common algebraic notation found in most units today. The article is well written and accurate. I substituted nickel metal hydride batteries when I could no longer get HP replacements. They too far outlast the original NiCads. I do remove them to charge them in a quick charger however. Although the equation solver program is quite interesting, since I am long since retired I will probably never use it. Still I throughly enjoyed the article. Great fun. I have had a first- then second-hand HP19C since 1980 when I was a student. The battery died circa 1982 and I was unable to get a replacement. 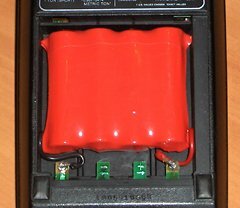 Reading your article inspired me somewhat so I purchased 4 NiCd solar light batteries from the hardware store and broke open the battery pack by cutting the pack seal in the front adjacent to the contacts. In with the new cells, cut and add some sheet metal contacts, position ye olde springs and a few twirls of duct tape. Guess what it works like a charm!! Even the bl**dy printer with paper that’s been in there for a quarter of a century works perfectly.